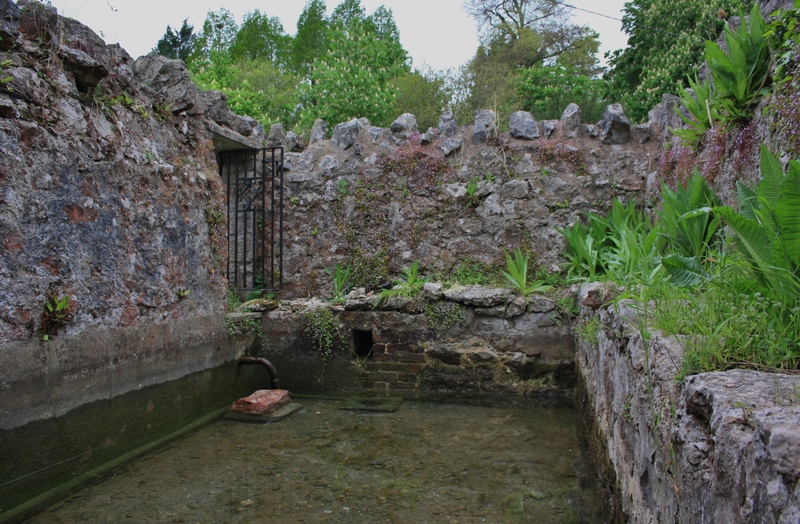 Another Beuno’s Well, this time at Tremeirchion which lies a mile or so to the north of Bodfari, between the A55 and A541 and sitting directly on the pilgrims’ trail which traced the route of Winefride from Holywell to Gwytherin. There is little in the recorded lives of Beuno to link him to Tremeirchion; it has been suggested that a pupil of Beuno built a foundation here. The first recorded church here dates from 1240 though it is quite likely that earlier churches stood on the site. Today the parish church bears a dedication to Corpus Christi. Still, however Beuno’s name arrived in Tremeichion it echoes through the village with the well at one end and at the other St Beuno’s Jesuit College, now a retreat, built in the village in the 1840s. The name Tremeirchion has in the past been mis-interpreted as the Town of the Maiden, again trying to link the location with Winefride. A more historically accurate interpretation, based on the original name of Dinmeirchion, is Fortress of Meirchion in memory perhaps of Merchion Gul, a fifth century king of Rheged.. 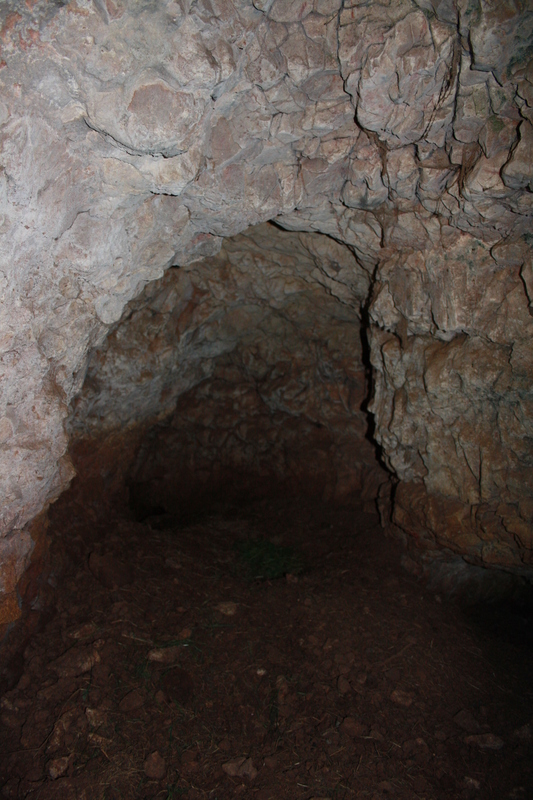 The Ffynnon Beuno bone caves, in the hills above the well bear testament to the length of habitation of the area, finds of animal bones and prehistoric tools showing that these caves were home to the last of the Neanderthal population and the first humans in Britain some 35000 years ago. 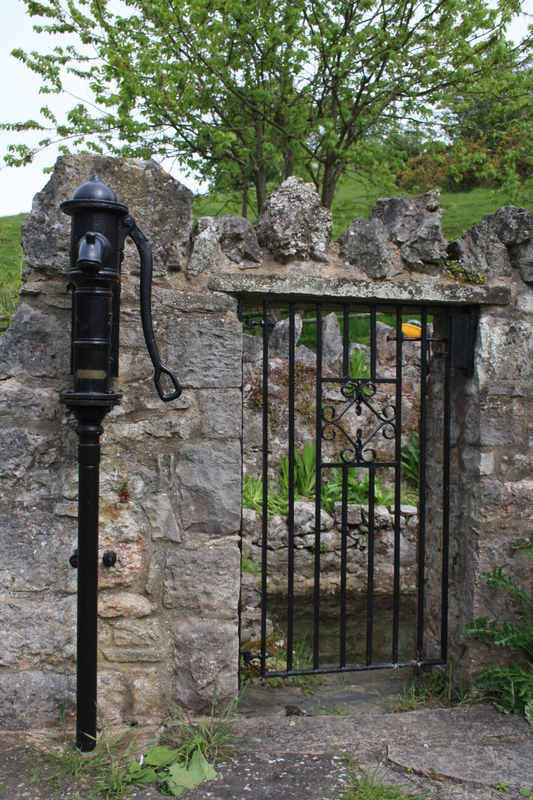 Beuno’s well itself has interested me for several years, mainly through its apparent inaccessibility. It sits behind a high wall in the grounds of a cottage bearing the same name, with only the famous carved head, through which the overflow runs, visible to the passing public. So I was delighted to be given the opportunity by its new owners to see inside. The original house at Ffynnon Beuno dated from around 1560 but was recorded as derelict in the 1980s. When reconstruction began around that time the remaining walls collapsed completely. What stands there now if effectively a new house, although attempts have been made through the use of photographs and local memories to recreate the original as far as possible. Although generally a farmstead, the house served as a public house in the nineteenth century, perhaps another echo of the hospitality accorded to passing pilgrims and visitors to the well. Continuing the theme of hospitality since its rebuild, the house has served as a restaurant; and the present owners offer a “glamping” experience, providing accommodation in a few attractive shepherds huts sited on adjoining hillsides. 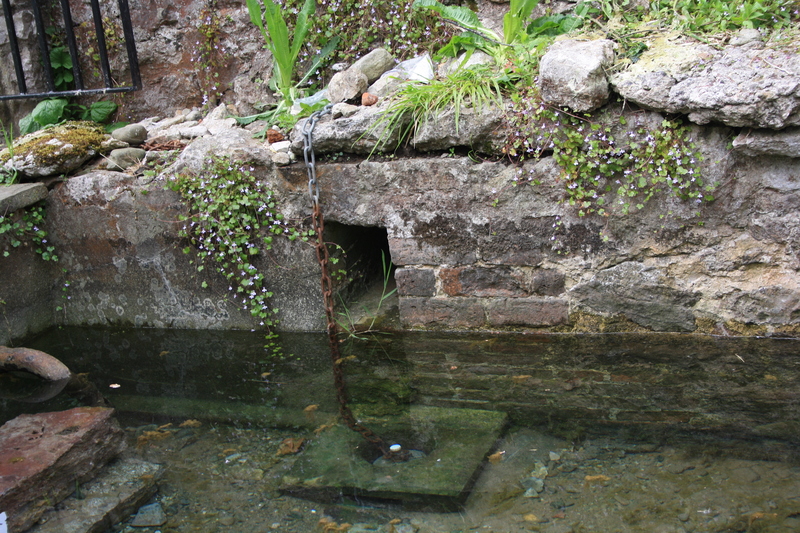 The spring rises almost beneath the house itself at one end of a rectangular tank measuring some 10 feet by 18 feet which holds the spring water. 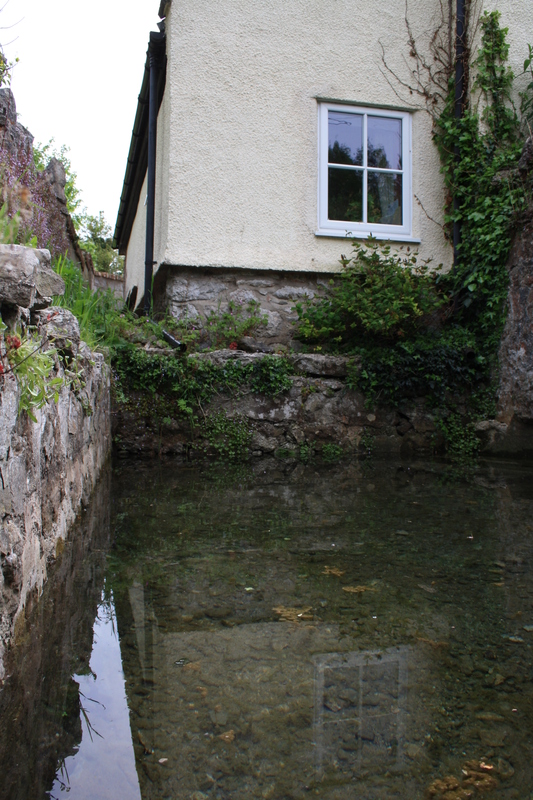 At the spring end of the tank two steps descend into the water, although these now lead down from a blank wall. Whether at one time there was actually access from inside the house, or just another external entrance is uncertain. one correspondent has reported that during reconstruction work during the 1980s evidence of an earlier door leading from the house to the steps could be seen, suggestive perhaps of an indoor dressing room with access to the pool. Water can fill the tank to a depth of around three feet before the overflow begins to trickle through the mouth of the stone figure on the side of the tank furthest from the source and closest to the road. From here the water would flow into a small basin with steps down to it, although at the base of this there is a grating and water is channelled away underground. Remarkably at this end of the tank there is a large plug which can be removed to allow the water within the tank to completely drain away. The spring will fill the tank from empty to the level of the overflow in some 12 to 24 hours; whilst once the plug is pulled it will empty in something less than an hour. The size of the well tank at once suggests that the well has in the past been used as a bathing pool, though whether for its healing qualities or for more general health and well being uses is unclear. 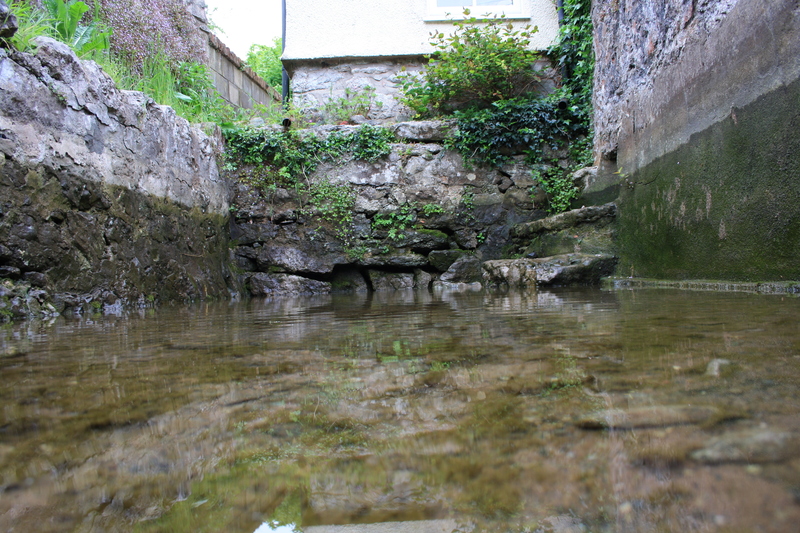 It is well-documented that in the 18th century a number of springs were adapted as outdoor bathing pools and there are several other well preserved examples in the area. A note from the 1897 suggests that the tank is medieval, however it has been frequently restored and rebuilt and is so heavily rendered with concrete patches and lacking in features it is difficult to date. Another more prosaic suggestion is that the tank merely formed a reservoir for the farm water supply. There is a water pump standing beside the entrance to the tank which draws water from the tank. The present working pump was restored in 1987. Given that the water source from the spring has been identified as being at a depth of several hundred feet below the farm any pump could not tap directly into the source so some form of reservoir would have been necessary. Such a feature of this size built solely as a reservoir would be unique in itself and relatively unlikely. It is probable that it was used at the very least as a bathing pool. For such a substantial, named and well-maintained well the lack of surviving documentation is surprising. There are a number of twentieth century sources which refer to it stating that “it was once in great repute as a healing well”. The source of this phrase appears to be a short item in Archaelogia Cambriensis from 1887 written by C A Newdigate. He was then a young student at St Beuno’s College, and although not native to the area presumably must have spoken to local residents concerning the history of the well. Still the reliance on documentation, particularly from the internet can be a dangerous thing. It is more than possible that a major healing centre was active here before the eighteenth century, but no one thought it necessary to record the fact. A number of researchers believe that the layout of the pool is heavily indicative that it has had healing uses.at some period. Representing the counter argument we have the journalist and African adventurer H Morton Stanley. He spent some of his teenage years living at Ffynnon Beuno in the 1820s, albeit unhappily, when it was run as a public house by his Aunt Mary. Writing in his autobiography in the 1890s he recalls the well clearly, likening it to that at Holywell although stating that, unlike St Winefride’s it boasted “no virtues beyond purity and sweetness.” He does state that the outflow from the tank is provided for “the benefit of villagers”, but what precise benefit he does not enlarge upon. If accurate, this record could be a strong indication of the lack of healing traditions concerning the well. Such beliefs, although by then beginning to die out, would still be widespread within the population at the time, and sitting in the pub kitchen would be the best place to hear them. Thus the use of the well for healing must be in some doubt. The presence in the churchyard of a medieval carved cross, for many years lost but now restored, which itself had a reputation for miracles, may have been a more important healing location than the well in this village. A number of travel writers visited Tremeirchion in the 18th century, including Dr Johnson and Thomas Pennant. They each visited and commented upon the church but fail to mention the well in their accounts. Despite this it is clear that the well has represented a significant landmark and probably carried important religious links for many centuries. It occupies a prominent place by the roadside on an important medieval pilgrimage route. The name itself has been recorded for several hundred years and was probably known long before that. The famous stone figure built into it is considered a medieval relic. 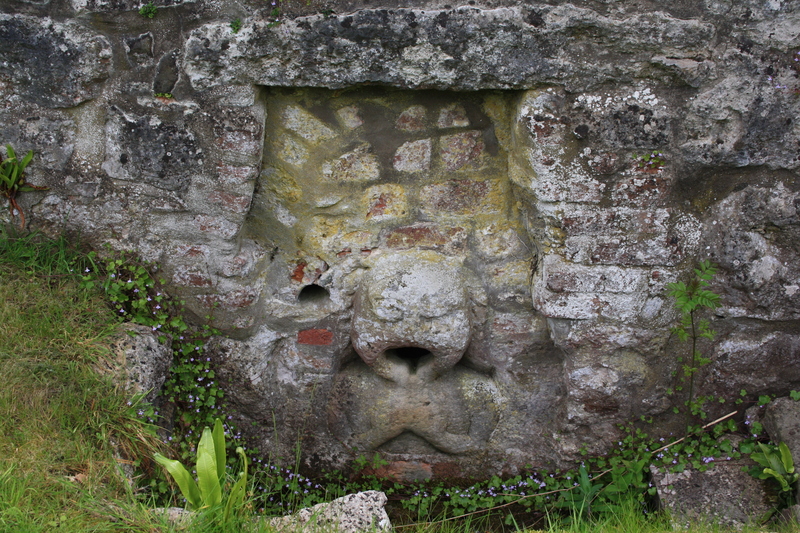 Many writers have considered the stone head through which the water flows to be representative of some form of head cult associated with the spring, traditions which occur in several parts of Wales and further afield. It has also been suggested that it represents another link with Winefride, recalling her severed and reattached head. It may also represent Beuno himself. The head cult theory is easily discounted, closer inspection shows that the effigy is much more than a head, since the upper part of a body can also be seen, with arms either crossed over the chest or with hands together in prayer, thus clearly having religious overtones. The head has been in situ since at least Stanley’s time in the early nineteenth century. I have so far found no earlier reference to it. Maybe it was placed here when the occupants of the house decided to take control of the water supply leaving this an outlet for the pilgrims who had so long venerated and used the spring in passing. The provision of such a feature may have appeased early objectors to the annexation of a previously common water supply. Was it carved for the well, or is it, as seems perhaps more likely, a gargoyle or figure taken from some other demolished building and reused at the site of an historic well? All in all a visit to this particular Ffynnon Beuno raised a few more questions than it answered. A well tank of that size must surely have had a use other than that as a farm reservoir – a handsome outdoor bathing pool but was it ever used for healing? And if it was once in great repute as a healing well how can it be that such traditions have been so completely lost? Stranger things have happened and the story doesn’t end here I’m sure. Corpus Christi Church Tremeirchion. Guidebook. Rev C A Newdigate (1887) Carved and Incised Stones at Tremeirchion. Arch Camb. the stone figure is reminiscent of the Matronae figures discovered at bath, which date back to Roman-British times.